We offer a range of beautiful sash windows to homes in Fleet, Hampshire, Farnham, Camberley, Aldershot, Basingstoke, Hook, Farnborough, parts of Berkshire, Surrey, Bagshot, Lightwater, Cove, Frimley, Yateley and surrounding areas. Whether you want a modern vertical sliding sash window or a more traditional box sash window, we are able to provide you with the perfect match. Visit our online quote calculator for a free sash window price. Cristal Windows are proud to work with three very different, high end suppliers to provide a range of simply stunning sash windows to Fleet, Hampshire, Farnham, Camberley, Aldershot, Hook, Farnborough, Bagshot, Lightwater, Cove and surrounding areas. Each one has its own unique design and features, which means you are sure to find the perfect double glazed sash window for your home. All of our uPVC sash windows are enhanced through the use of modern technology. They offer exceptional robust performance with their modern spring balance mechanisms that ensure smooth and easy operation, with no snagging or lagging. Each sash window has a multi-chambered profile combined with state of the art double glazing, ensuring that your uPVC sash window will offer superb energy efficiency. It will minimise heat loss and keep you warm no matter how cold it is outside. Our sash windows are each developed with a slightly different style howver, they can all have their appearance tailored by our outstanding choice of colour and woodgrain foils. Added to this, they can be enhanced with replica period hardware that adds that original decorative touch. We offer our 10 year fully insured guarantee on all of our double glazed sash windows, ensuring that you have peace of mind when it comes to longevity, performance and quality. Our guarantee is incredibly comprehensive, ensuring that your windows are completely protected. 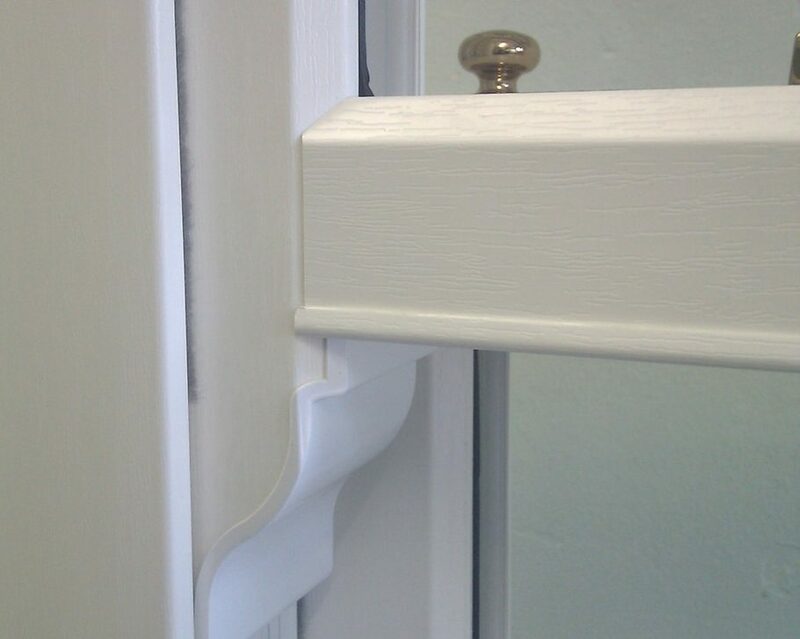 Our REHAU sash windows are the Heritage sliding sash style. Perfectly designed to complement older properties or to add character to new build homes. They use high quality materials in their manufacture, and the very latest in design advances to ensure they offer impeccable performance. We also provide Evolve vertical sliding windows from Synseal, which combine modern technology with traditional style. They have a clever tilt function on the upper sash, meaning that you can easily clean your windows or allow fresh air to enter your home without having to open the sash wide. Finally, for the more traditional home, we have the box sash window from KAT UK. These designs replicate traditional windows from the 17th Century and will enhance the beauty of any period home, although they are popular with new build properties for the charm and character that they add to a building. Whichever one you choose, there are some similarities in design, such as modern spring balances, multi-chambered profiles and superb double glazing, that occur in all three options. Here at Cristal Windows, we offer affordable sash window prices in Fleet, Farnham, Camberley, Aldershot, Basingstoke, Hook, Farnborough, Bagshot and surrounding Hampshire areas. By using our free online quote system, you will be able to budget for your project with us. We are happy to guide you through the options available to you, and help you choose the perfect vertical sliding sash windows for your home. We can then give you a unique quote based on your specifications. Either contact us to have a no obligation discussion of your requirements, or try our free online quote calculator and get your sash windows quote. We look forward to hearing from you.